It's not very long since I started baking but each time I bake something I enjoy the experience thoroughly. Kneading, rolling, shaping gives me lots of relaxation. And the joy of seeing the perfectly baked goodies out of the oven is priceless for me. I had not baked anything since last month..you know..trying to loose weight before my vacations... but still each time I saw any baked goodies in my fav blogs I was so tempted to bake..I only know how much will power it required to stop myself from baking anything sinful. And while I was trying not to indulge in baking anything Srivalli announced the Indian Cooking Challenge for this month...I have to confess..I got so happy when I saw the challenge...baking...wow..that too savoury biscuits. Since I had missed last months challenge I was determined not to miss this months. The challenge was to make Karnataka special..Iyengar bakery khara biscuits...recipe to be referred was that of Champa's. And champa does not require any introduction. Her baking recipes are always fool proof...so I had even more reasons to be happy...yippee...these biscuits does not require loads of butter and moreover these are savoury ones....these are really so addictive and vanished in no time. I did very few changes in the original recipe. Added sesame seeds and ground ginger, green chillies and coriander instead of chopping them. I have convection oven so I baked these at 180 degrees. Line the baking sheets with slightly greased aluminium foil and set aside. Grind coriander, chillies and ginger together and keep it aside. Sift flour and salt together and keep aside. With the help of beater cream butter and sugar till smooth and creamy. Now in the creamed butter and sugar mixture add in the flour and salt mix along with ground green paste and sesame. Make a dough using yoghurt...add little by little and make a stiff dough. Don't over knead the dough. The dough should not be very wet. Roll out the dough in 1/4 inch thickness and with the help of desired cookie cutter cut into shapes. Bake in the pre heated oven for around 23 minutes. The biscuits will be soft when done but will firm up on cooling. When cool transfer these biscuits in an air tight container. Enjoy these with a cup of hot tea. My mouth is watering, this looks really good! Lovely post! good idea to grind n use the spices...the color looks fab!! Looks simply delicious and perfect.. yummy !! 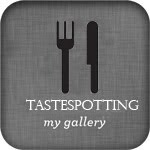 Omg, Raji urs looks stunning and super prefect..beautiful clicks, feel like grabbing some..
Tasty and delicious looking biscuits...Totally agree with you on how much will power it takes to refrain from trying out something you love.. Perfectly baked, spicy cookies!!! They look so adorable & tempting!! Those look yummy. Ginger is a nice twist. Khada biscuits looks crispy, crunchy, tasty, yummy and lovely. Feel like having it now with a cup of tea. Excellent! they all look so delicious and perfectly round. Like the sesame addition too. Nicely shaped cookies...Liked the addition of ginger. Raji the khara biscuits look perfect dear- lovely bake !! Looks superb, perfect with a cup of hot tea. They smell different & good. Liked the aroma of coriander leaves & green chillies. I don't like usual sweet biscuits, the 50 50 is also not good. Yours is mouth watering. Would like to give it a try, but i don't have convection mode. Only MW & grill. :-( Good presentation too. All the best, Raji. Woo hoo... sesame seeds is a wonderful addition..
Its been a loong time I ate these.Thank you for the recipe.I love salty cookies. Aromatic flavorful and delicious cookies. The biscuits turned out great! Biscuits look perfect and the pic is so tempting! If only I could grab them from the screen!! Very well done khara biscuits! Need to try. These biscuits are looking great. I love salty version over sweet and home baked must be just out of the world. I enjoyed every bite of it, though virtually...take care, sonia ! 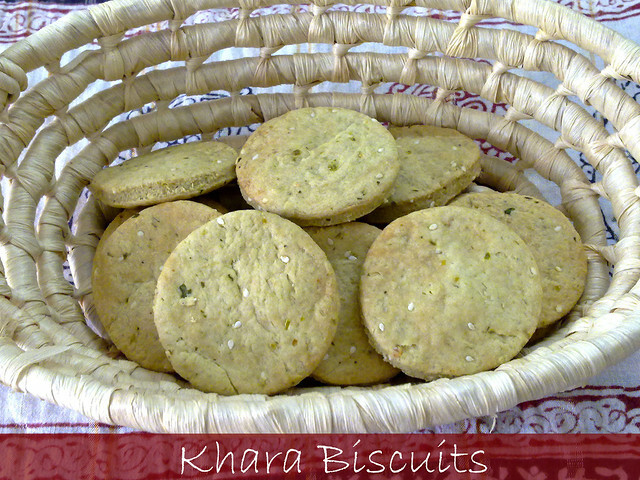 Khara biscuits reminded me of Bangalore :) I used to always store them at home and dip them in hot tea !! Lovely cookies..perfectly spiced and baked!! Khara Biscuits look perfect! Never tried..BTW I liked your method. Will definitely try this. Thanks for sharing. Nice presentation. Oh dear,these cookies is so addictive. How I wish I have a dozen to chew on right now! They look very lovely, Raji.